Multi is formulated with premium, bioavailable forms of the vitamins and minerals necessary to meet nutritional requirements spanning from adolescents to the elderly. 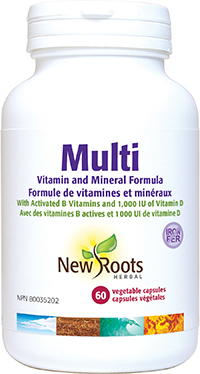 New Roots Herbal’s Multi is the ideal vitamin and mineral supplement to form the foundation for excellent health. Even the most balanced of diets may have nutritional shortcomings. Multi contains therapeutic amounts of the vitamins and minerals necessary to maximize the digestion and intestinal absorption of critical nutrients. Baseline nutritional requirements are often difficult to meet year-round. Variables—that include food grown in nutrient-depleted soil often picked prior to ripening, or seasonal deprivation of adequate sunshine for vitamin D3 production—can leave your health at risk. Studies have proven the importance of multivitamin supplementation for the elderly, citing improved nutrient status, better cognitive function, and a reduction of falls that contribute to fragility fractures. Adolescents and young adults can also benefit from our Multi to compensate for the consumption of foods of convenience in a fast-paced lifestyle. Each capsule of Multi will lead to better overall nutrition and proven protection from diseases and infections. Adults: Take 1 capsule daily or as directed by your health-care practitioner. If you are taking other medications, take this product a few hours before or after them. Other ingredients: Vegetable magnesium stearate, microcrystalline cellulose, and silicon dioxide in a non‑GMO vegetable capsule composed of vegetable carbohydrate gum and purified water. Silica Liquid is an easy-to-absorb form of the critical nutrient essential for full-bodied lustrous hair; supple skin; and strong, healthy nails. Our highly bioavailable B12 Liquid is a convenient and effective delivery method for this critical vitamin. Helps to improve ovarian function in women with oligomenorrhea and polycystic ovaries; in the management of polycystic ovarian syndrome (PCOS) by helping to restore normal ovarian function; in the management of PCOS by reducing oxidative stresses; to restore ovulation and oocyte quality, and to normalize menstrual cycle irregularities; to reduce serum testosterone in women with PCOS; in the management of PCOS’s hormonal and metabolic conditions by promoting healthy glucose metabolism. An antioxidant for the maintenance of good health. Take Your Multivitamins; There Is Consensus!